OMEGADYNE® offers transducer quality strain gages in dual linear patterns in a half-bridge design with a common tab. 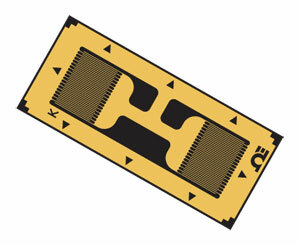 These strain gages might be used for transducer design for beams that have a contraflexure point. Defined as a point in a structure where bending occurs in opposite directions. A transducer may also be described as a reversed bending beam. The grids are linear, both in the same direction, and are typically used for bending strain applications.